Charles Fey, German guy who revolutionized automated gaming and the whole Casino world, made his famous Liberty Bell, the first slot machine, back in 1895. 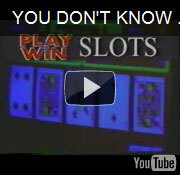 That was the beginning of a new era, the era of slot machines. Well, it was quite simple - three spinning reels and cracked Liberty Bell painted on each. Liberty Bell was the first mechanical reel slot. Every reel had 10 symbols, hearts, diamonds, horseshoes and spades, but the main symbol was cracked Liberty Bell. If you were lucky, you would get up to fifty cents. Wow! Never before the machine had an ability to award a real payout. It would be just great to patent an invention like that, but Fey had to rent machines to local pubs and saloons, well, not for free, of course. The gambling law of the time prohibited gambling machines, so he awarded the players with free gums or drinks. 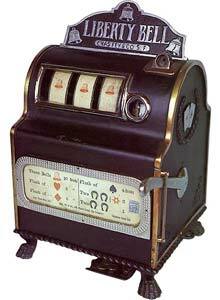 The original model was very simple - all you had to do was to insert a coin and pull down a lever. There was, of course, only one line, and three cracked bells made a winning combination. 'One arm bandit' was born. Players were often inserting all kinds of fake coins in Charles' machine. Fey wasn't trilled about this, so he invented the first detecting pin, which could distinguish real coins from those fakes. His machines became so popular that he couldn't make enough of them. After some time, Herbert Mills Company produced the Operator Bell Slot, with 20 symbols on each reel. They added some fruit symbols, and introduced to the world the first fruit slot machine. Charles Fey opened his Liberty Bell Saloon Restaurant in Reno, Nevada and dedicated the second floor to his inventions. Besides the original Liberty Bell, there was also a collection of over 200 antique slot machines. The saloon was closed in 1995, but you can still see all the exhibits if you visit The Nevada State Museum, where all the slot machines invented and manufactured by Charles Fey are displayed.